Barbeque on art. Feuerring – The Original. Good company and sensory pleasures are fundamental aspects of the Feuerring philosophy of life. For centuries, all communal life centred around the fire. 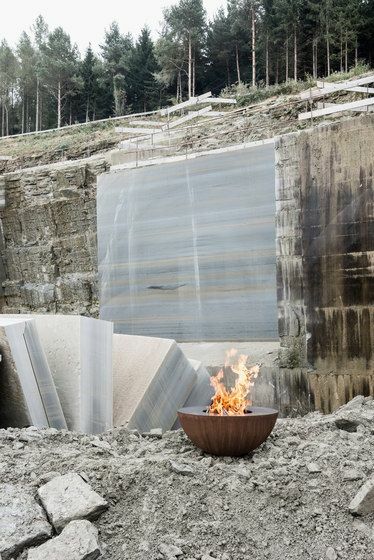 The Feuerring – as a modern fire pit – issues an invitation to once again draw in and savour life around it, no matter what the season. The welcoming atmosphere and inspiring warmth of a crackling fire, the cosy com panionship of friends and guests and, above all, the gentle and healthy barbequing of premium ingredients, culminating in the creation of culinary menus, are central to us at Feuerring. As we say: Pleasing all our senses! Feuerring LUNA is available in 3 different sizes. Barbeque on art. Feuerring – The Original.